We’ve told you about Shot Scope’s V2. It’s our opinion that the Shot Scope V2 is one of the best golf analytics packages in the industry. For a limited time, Shot Scope is available exclusively to MyGolfSpy readers at the absolute lowest price anywhere. During this offer period, golfers can purchase the Shot Scope V2 (normally $250), for only $159. That’s $90 OFF the standard retail price. For those preferring percentages, it’s a shade more than 33% off. 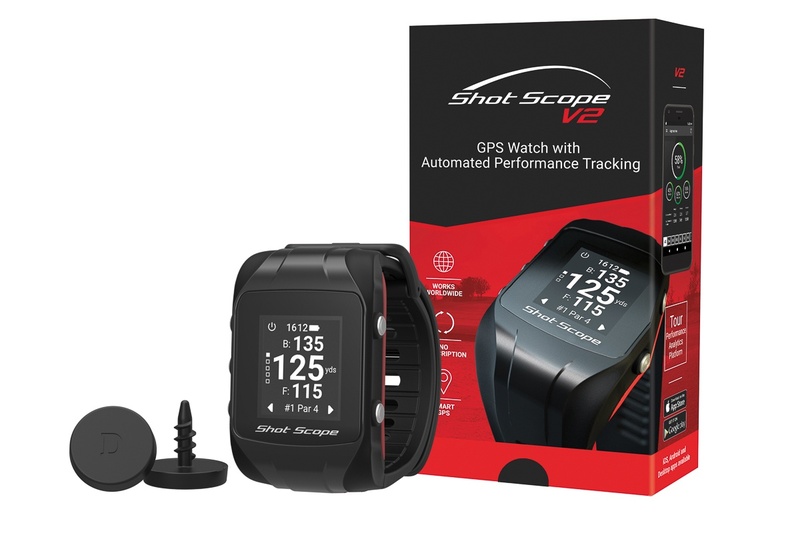 Shot Scope offers over 100 Tour-Level statistics, a dynamic GPS that provides the distance to the front, back, and middle of the green as well as hazards. There are no annual fees, required tagging or a need to carry a phone in your pocket. Shot Scope is renowned for excellent customer support, and relies on its own database of course maps, so should questions arise– a single phone call is all that’s required. This offer won’t last long – seriously; it won’t. It ends on Sunday, 7th April. So, if you’ve been on the fence about giving shot tracking and full game analytics a try in 2019, here’s your excuse to go for it. 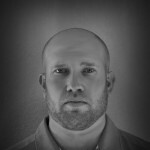 MyGolfSpy’s job is to help you put the best clubs and gear that help lower your scores. We don’t care about names, we only care about the stuff that actually works, and this works. Concentration on shots over 18 holes is a challenge. How is adding all of this statistics keeping going to allow you to focus on each shot? Seems like a lot of work for the amateur golfer. This would be an ideal job for a caddie. But who plays with caddies? I enjoy looking at the course, enjoying my time with my partners and just getting out of the house. I use a Bushnel NeoXS for approximate distances but then chose the club based upon time of day, weather, temperature wind, slope, ball position, etc. If I have to record all of this other information, seems like overload to me. What am I missing about this product? Great point. Keep it Simple and relevant to the game! Before buying the Shotscope V2, I tried the Garmin S60 club entry (tedious and annoying) and the Garmin tags (3 didn’t work – sent back – 2 replacements didn’t work) and the GameGolf Pro tags (nightmare, picking up clubs from previous holes and adding them to the next hole causing zig-zag stats). Shotscope tags just WORK and after 3 rounds I have more stats than I ever had with the others. Simples! I’m sensing a bit of Capitalism invading #consumerfirst. Looking forward to seeing that trend pause. I will donate more. Got it! Thanks for the nice discount! Looking forward to utilizing this tracking system! Putts are broken down in 5 or 6′ increments all the way out to your longest putt. IMHO the lack of strokes gained data is the piece of info missing from the system currently. When I try to claim the offer it comes up with a price of $399. I’m based in New Zealand. Is the offer not available internationally? Hi Jason – That would be a question best answered by Shot Scope. I know it’s based in the UK, but not sure how they handle orders from New Zealand. Have you contacted them directly? No, was hoping they might reply here as they had in one other case. Might try through their own webpage. As an updated I sent a message on and was informed that the offer is only available in the USA. Very disappointing. In New Zealand. Tried claiming the offer but I’m assuming it tries to recognise location and local currency. Price goes up to $399 which in no way is close to 159 USD, unless Shotscope are charging around $120 USD in shipping. Bit of a fail for me I’m sorry. Pity as solution looks to be an improvement on GameGolf that I’m currently using. Same in AUS. I’d take up the offer if it was available here. Do you actually have to wear the watch? As in, can you just attach it to your bag/cart/push cart attachment? Kevin, I asked Shot Scope directly–yes you must wear the watch. The front pocket won’t suffice either. You cannot break statistics down by full/half or 3/4 swing. The system shows average distance which includes every shot you have taken with a specific club unless you go in and mark the shot as “Positional” in post round editing. You can also select P. Avg which attempts to eliminate outliers which would hopefully get all of your 1/2 swings and other very bad misses. Do you have to track putting stats? I can see myself always forgetting to manually enter the putts and locating the hole, especially when I chip one close and my buddies give me the putt, I also never know whether to count a putt from off the green as a putt or a chip. But I like the idea of tracking my driving and approach data. A “putt” is only counted on the green if you want to keep accurate stats for GIR and putts/hole. I jumped on this! Been intrigued by it since it came out, read through the reviews, but didn’t think I needed a shot tracker for my game. Now I’m getting to the point where my game is evolving and I need to learn my true distances to help with club selection, and to identify specific weak areas to use more practice time on. There’s an option to buy on Amazon, which I did as I have Rewards points that I used to reduce the price even further. Same price on Amazon. Not a deal. Sorry. 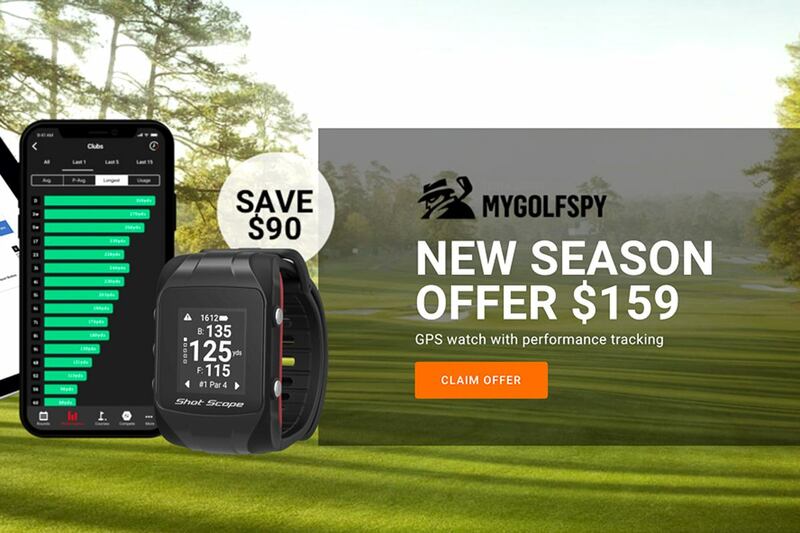 The reason for this is because sometimes our payment system will decline cards so we provide Amazon as an option at checkout, we have matched the pricing on that listing for MyGolfSpy for the duration of the deal. Thanks for replying. Actually I just purchased from your website to take advantage of this special offer. Last year, I tried and returned the one that requires cellphone in the pocket; I couldn’t get used to a phone in the pocket plus their tags are big and a bit intrusive on the grip end. I am hoping ShotScope will be better and I can use it regularly. The tags go in the top of the club but the watch automatically senses them when you swing, the system works out which swings are shots. So there is no tagging, but tags are used to identify the club used. The Shot Scope team have a few methods to cope with counter balanced putters, just ask them. Seems there’s a 50€ rebate during wgc matchplay. Shipping costs will probably remain the same. I realllly want to like this. I do! but that watch looks MASSIVE. For the v3 version can they please create a GPS/Tracking unit like the Garmin G10? Something small, unobtrusive, that can be clipped to a belt or kept in a pocket? Then I would be 100% on board. They already seem to have small markers for the clubs, so they should be able to shrink down the unit too! I have played over 50 rounds with the watch, it is very light and I didn’t notice it after 5 holes. Can only recommend the product! I’ll try to get a look at one. But I don’t even like golfing with my small 38mm field watch on. So I might juat not fit the profile. Good deal, I purchased in their pre-sale late 2017 and have played over 30 rounds with Shot Scope. Stats are brilliant, helped dial in distances. Took the info along to a club fitting in the summer. The watch is on the big side but very light. Don’t notice it at all now when I play. L, how “brilliant” are the stats? I ask because I currently use Arccos and the stat presentation approaches useless. Thank you in advance for any insight you may have. I didn’t go with Shot Scope because I didn’t like the idea of wearing a watch. And I think someone did a study that suggested wearing a watch could adversely affect your golf swing. If only there was an entity that reviewed golf gear, and could give us consumers a full, in-depth review and comparison of the current data tracking systems. Shot Scope isn’t any bigger than some of the Garmin, Golf Buddy, Bushnell watches. Was given the V2 for Christmas by my daughter. Played a few rounds, watch is very light. Some interesting stats but I think I will need to play more rounds before the stats are really useful. Like the club distance information, I had to contact their support team about a driver stat, solved the issue in 24 hours. Asked about a V3 and was told there is no plans at the moment. The one thing i wonder about is how does it take into account all the “odd” shots i take — for example, i might have identical yardages on 2 separate shots, but i could hit possibly 3 different clubs depending on conditions (downhill lie, uphill lie, the wind, playing for a high shot, or a roll-out shot, etc.). I find myself doing this quite often during a normal round, and the golf course I play on isn’t really all that hilly. I wonder if the club averages get distorted when folks do that. Shot Scope has a performance average distance, which removes both good and bad outliers to provide an accurate average of a good swing/good strike. The more you play the more accurate the system becomes. Excellent question. ShotScope offers you two average distances in its analytics – one is a true average which includes every shot you hit with a specific club, and then it offers P-Average, which filters out obvious outliers – like when you chip with a 6-iron or hit a punch shot, etc. Similar issue – FYI – I have the Garmin S60 watch, which comes with built-in shot tracking (I don’t have the add-on club tags, so I just select which club I hit on the watch after each shot… only takes 2 seconds so not really a problem in an of itself). However, Garmin’s software for shot tracking is far inferior to the other big players out there (Arccos, GG, SS) in that it DOESN”T adjust for true average… i.e. if I fat an 8i 40 yards, that will be weighted equally in the overall 8i distance average. Essentially, this somewhat renders the tracking useless, or at best, not nearly as useful as others. As a user-fix, I had to go in and create two custom clubs (“BAD SHOT” & “NOT FULL SWING”) that I could select after I hit either type of shot so as not to have them count against my averages. It’s annoying, and frankly, I’ve stopped using the feature very often b/c I just don’t get much out of it post-round. I want to upgrade to one of these other trackers, but having just dropped $250 on the top end GPS watch, I can’t justify it…. yet.